In September, DC Entertainment reveals the origins, secrets and shocking fates of top Super Heroes in 56 special #0 issues starring Superman, Batman, Wonder Woman, The Flash, Green Lantern and more! 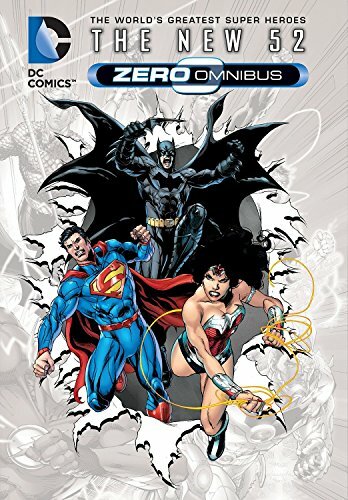 Now, these issues are collected in a massive hardcover just in time for the holiday season, with stories written and illustrated by top talent including Geoff Johns, Grant Morrison, Jim Lee, Brian Azzarello, Scott Snyder and many more! Featuring the work of Geoff Johns (GREEN LANTERN, ACTION COMICS, THE FLASH), Grant Morrison (ALL-STAR SUPERMAN, BATMAN INC., NEW X-MEN), Jim Lee (BATMAN: HUSH, ALL-STAR BATMAN AND ROBIN, X-MEN), Brian Azzarello (100 BULLETS, JOKER), Scott Snyder (DETECTIVE COMICS, AMERICAN VAMPIRE) and many more!